Human bitter taste receptors are encoded by a gene family consisting of 25 functional TAS2R loci. In addition, humans carry 11 TAS2R pseudogenes, some of which display evidence for substantial diversification among species, showing lineage-specific loss of function. Since bitter taste is thought to help prevent the intake of toxic substances, diversity at TAS2R genes could reflect the action of natural selection on the ability to recognize some bitter compounds rather than others. Whether species-specific variation in TAS2R pseudogenes is solely the result of genetic drift or whether it may have been influenced by selection due to different feeding behaviors has been an open question. In this study, we analyzed patterns of variation at human TAS2R pseudogenes in both African and non-African populations, and compared them to those observable in nonhuman primates and archaic human species. Our results showed a similar worldwide distribution of allelic variation for most of the pseudogenes, with the exception of the TAS2R6P and TAS2R18P loci, both of which presented an unexpected higher frequency of derived alleles outside Africa. At the TAS2R6P locus, two SNPs were found in strong linkage disequilibrium (r2 > 0.9) with variants in the functional TAS2R5 gene, which showed signatures of selection. The human TAS2R18P carried a species-specific stop-codon upstream of four polymorphic insertions in the reading frame. SNPs at this locus showed significant positive values in a number of neutrality statistics, and age estimates indicated that they arose after the homo-chimp divergence. The similar distribution of variation of many human bitter receptor pseudogenes among human populations suggests that they arose from the ancestral forms by a unidirectional loss of function. However we explain the higher frequency of TAS2R6P derived alleles outside Africa as the effect of the balancing selection acting on the closely linked TAS2R5 gene. In contrast, TAS2R18P displayed a more complex history, suggesting an acquired function followed by a recent pseudogenization that predated the divergence of human modern and archaic species, which we hypothesize was associated with adaptions to dietary changes. The perception of bitter taste is thought to have evolved as a protection from toxic and harmful foods ,. However, not all bitter compounds evoke the same aversive reaction in different species and, in particular, among primates . Therefore, it has been hypothesized that consumption or rejection response depends upon the relative occurrence of bitter and potentially toxic compounds in an animal’s diet . The number of different bitter taste receptors varies greatly across species , but all of them belong to a family of seven-transmembrane G protein coupled receptors (GPCRs) known as TAS2Rs or T2Rs. In humans, this gene family is encoded by 25 functional TAS2R loci, which reside on chromosomes 5, 7 and 12 . In addition to these genes, humans also carry 11 TAS2R pseudogenes . Polymorphisms in these genes have been shown to modulate the taste response to different compounds, both natural and synthetic -, and showed evidence of evolutionary pressures -, highlighting the importance of studying both TAS2R genes and pseudogenes. Pseudogenes are considered genomic fossils, classically defined as genomic loci with sequence similarity to functional genes, but lacking coding potential ,, often due to disruptive mutations such as frameshifts, premature stop codons and deletions. However, recent studies have demonstrated that some pseudogenes may likely have a function, providing evidence for their plasticity and a dynamic role in evolution -. A number of authors have described these events with a “less-is-more” hypothesis, suggesting that gene loss, or pseudogenization, may serve as an engine of evolutionary change, especially in human evolution ,. In fact, previous phylogenetic analyses demonstrated that remarkable variation exists in both TAS2Rs genes and pseudogenes in different lineages, suggesting that the ability to perceive bitterness may be mostly due to the repertoire of TAS2R genes ,. For instance, the mouse genome contains 33 functional TAS2Rs loci but only three pseudogenes, and the evolutionary relationships between human and mouse genes were shown to fall into three categories, depending on their orthology: 1) one-to-one orthology; 2) one-to-multiple orthology; 3) multiple-to-one orthology ,,. In contrast, zebrafish and chicken have only four and three TAS2R loci, respectively ,. Comparative analyses showed that primate TAS2Rs had a higher ratio of nonsynonymous/synonymous substitutions and a lower selective pressure on this gene family compared to rodents ,. To better understand the evolutionary mechanisms underlying taste receptor pseudogenization events in the human lineage, we performed a survey of the human genetic variation at nine human TAS2RP loci. We then compared these to the homologous pseudogenes present in archaic human forms (i.e. Neandertal and Denisovan), as well as in other five primate species, Chimpanzee, Gorilla, Orangutan, Gibbon and Mouse Lemur. We examined the intra- and inter-species variation patterns to search for possible footprints of natural selection at these loci, with the goal of understanding the potential adaptive role of taste receptor pseudogenes in the evolutionary history of modern humans. Nine human TAS2R pseudogenes were selected from the literature and are shown in Table 1. Modern human variants located in these genes, together with their surrounding genomic regions (+/− 100 kbp), were retrieved from the 1000 Genomes Project PHASE I database ,, which provided data on a total number of 1,092 individuals belonging to 14 different populations. Neandertal and Denisovan variants/sequences were retrieved at the UCSC Table Browser ,. Pseudogene sequences in humans (Homo sapiens), five other primates (Pan troglodytes, Gorilla gorilla, Pongo abelii, Nomascus leucogenys and Microcebus murinus) and one rodent (Mus musculus), were obtained from the Ensembl Genome Browser ,. This project was approved by the NIH protocol 01-DC-0230, reviewed by the NIH/NINDS CNS Blue Panel IRB and complied with the Helsinki Declaration of Ethical Principles. Haploview  was used to identify Linkage Disequilibrium (LD) patterns and haplotype blocks at the selected loci using the solid spine approach. Genealogical relationships among inferred haplotypes were constructed using the median-joining algorithm implemented in the Network 4.5 program . Haplotypes distribution across human populations were investigated using PLINK v.1.07 . Arlequin v.3.5  was used to compute summary statistics, such as nucleotide diversity (π), estimated heterozygosity (EH) and number of polymorphic sites (PS). Chi square-tests were performed to compare allele frequencies among different populations and the adopted significance threshold was adjusted using the Bonferroni correction (i.e. adjusted p = p value X number of individual tests). Metric Multidimensional Scaling (MDS) analyses based on the obtained FST values, were performed with STATISTICA v. 6.0 (Stat-Soft Inc, Tulsa, OK). MUSCLE v.3.3  (Edgar 2004) was used to perform multi-alignments of the examined sequences. A maximum likelihood tree was constructed with MEGA v.6.0  using the Tamura-Nei substitution model. To assess the relative support for each clade, bootstrap values were calculated from 10.000 analysis replicates, and the cut-off point for bootstrap replication was 50%. To test whether patterns of allele/haplotype frequencies and tree topology were consistent with neutral expectations, we performed three neutrality tests. For this purpose, the DNASP package  was used to calculate Tajima’s D and Fu’s FS values at each locus. Since deviations found using these tests could be caused by selection and/or demographic processes (e.g. population expansion and/or bottlenecks), we also performed the Li’s MFDM test , which is more robust in the presence of population size changes. Finally, GENETREE , was used to infer the estimated age of selected variants and the time of the most recent common ancestor (TMRCA). A total of 47 single nucleotide polymorphisms (SNPs) (Additional file 1: Table S1), annotated according to dbSNP Build 137, were observed in the nine selected pseudogenes. 32 of them had a minor allele frequency (MAF) above 5%. Unexpected patterns of genetic variation were observed for two pseudogenes, TAS2R18P and TAS2R6P, in populations from different continents. In particular, the derived alleles at four TAS2R18P SNPs (rs2290318, rs2290319, rs61928604 and rs61928603) showed significantly increased frequency (0.5) in non-African populations compared to African populations (0.053) (Fisher’s exact test, adjusted p < 0.01). Similarly, the derived alleles of TAS2R6P polymorphisms rs1859645 and rs11761380 showed a significantly different distribution (0.24 vs. 0.57) between Africa and other continents (Fisher’s exact test, adjusted p < 0.01). Both Neandertal and Denisovan genomes carried the derived alleles of the TAS2R18P SNPs rs2290318, rs2290319, rs61928604 and rs61928603. For the TAS2R6P SNPs rs1859645 and rs11761380, the Denisovan genome showed ancestral alleles, while the Neandertal genome was heterozygous at both SNPs. In addition, derived alleles of two SNPs located in TAS2R67P (rs319269 and rs34648613) and one in TAS2R64P (rs68071847) were more frequent in African populations with respect to non-African ones (0.68 vs. 0.11, Fisher’s exact test, adjusted p < 0.01), and were also present in both Neandertal and Denisovan genomes. Finally, the derived allele of one SNP located in TAS2R63P (rs2597986) was present only in a few African individuals (1.58%), as well as in the two archaic species. A total of eight haplotype blocks (Additional file 2: Figure S1 A-B) were inferred in the nine studied pseudogenes. Five of them (H1-H5) were on chromosome 7, with the remaining three (H6-H8) located on chromosome 12. H5, which contained TAS2R6 rs11761380 and rs1859645, and H6, made up of TASR18 rs2290318 and rs2290319, showed high level of LD (R2 = 1) and differed significantly across human populations (Table 2), with African populations carrying a lower percentage of derived alleles at these loci. The other haplotype blocks (H1, H2, H3, H4, H7 and H8) showed no significant differences among continents. Hblock, Haplotype block; Chr, Chromosome; MA, Minor Allele; F, Frequence. AMR, Latin Americans; AFR, Africans, EUR, Europeans; ASN, Asians. To test the significance of the observed structure, the distribution of the H5 and H6 haplotypes in human populations was also investigated by means of Analysis of Molecular Variance (AMOVA). For both TAS2R6P and TAS2R18P, most of variation was accounted for by differences within populations (86.67% and 72.07%, respectively), with a smaller percentage attributed to differences among (13.2% and 27.12%) and within groups (0.13% and 0.81%). 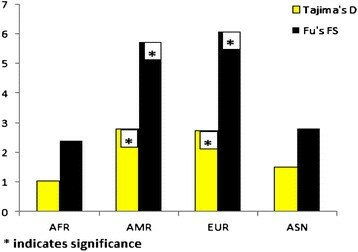 The global FST values were 0.13 for TAS2R6P and 0.28 for TAS2R18P, while those related to H5 and H6 haplotypes were 0.14 and 0.31, respectively. We constructed median-joining networks for the TAS2R6 and TAS2R16 pseudogenes in order to better understand the relationships between the inferred haplotypes. The resultant topologies (Additional file 3: Figure S2 A-B) identified of two major clusters defined by the presence of either the derived (GC for TAS2R6P, CA for TAS2R18P) or ancestral (AA for TAS2R6P, GC for TAS2R18P) alleles at the H5 and H6 haplotypes. The pattern of diversity shown in most of these pseudogenes was in accordance with the usual distribution of human genetic variation , where the diversity is higher in African populations than in non-African ones. However, a different situation was observed in TAS2R6P and TAS2R18P. African groups (i.e. ASW, LWK and YRI) showed lower values of both nucleotide diversity (π) and estimated heterozigosity (EH) at theTAS2R18P locus. With the exception of the ASW group, the same pattern was observed for the TAS2R6P gene. The number of polymorphic sites (PS) was similar in all the studied populations (Additional file 4: Table S2 A-B). To explore the population structure at these two outlier loci, we calculated pairwise Wright’s FST indices as a measure of genetic differentiation among different groups. A multidimensional scaling (MDS) metric was then used to plot the obtained FST values. This produced a clear distinction between continental populations for the observed variation. 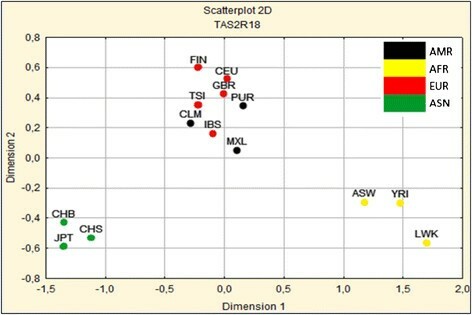 As shown in Figure 1, TAS2R18P was separated from African and Asian populations along the first dimension, with a distinct cluster, containing the European and Latin American (admixed) populations, occupying an intermediate position between them. Variation at the TAS2R6P locus showed a similar pattern of population structure among continental clusters (Additional file 5: Figure S3). Two-dimensional scaling of the F ST distance matrix calculated for TAS2R18P . AMR, Latin Americans; AFR, Africans, EUR, Europeans; ASN, Asians; YRI, Yoruba from Ibadan (Nigeria); LWK, Luhya from Webuye (Kenya); ASW, people with African ancestry from Southwest United States; IBS, Iberian populations from Spain; TSI, Tuscans from Italy; CEU, Utah residents with Northern and Western European ancestry; GBR, British from England and Scotland; FIN, Finnish; PUR, Puerto Ricans; CLM, Colombians from Medellin; MXL, people with Mexican ancestry from Los Angeles; JPT, Japanese from Tokyo; CHB, Han Chinese from Beijing; CHS, Han Chinese from Southern China. We also created a phylogenetic tree using the nucleotide sequences of TAS2R6P and TAS2R18P to understand the phylogenetic relationships between both modern and archaic humans and other primates. As shown in Figure 2, TAS2R6P sequences in Prosimians, Hylobatidae and Hominidae are closely related, sharing a common ancestor when compared to the outgroup sequence (i.e. Mus musculus) and showing short branch lengths of the tree, suggesting an ancient pseudogenization event at this locus. Longer branch lengths in Prosimians and Anthropoidea after their divergence may indicate that the pseudogenization at TAS2R18P locus occurred independently in the two lineages. It should be noted that these conclusions might be affected by problems with ortholog detection, considering the high dynamism and extreme complexity of this gene family. Maximum Likelihood tree of TAS2R18P and TAS2R6P . Bootstrap values are shown on the branch forks, the scale bar corresponds to the branch length and indicates 0.1 amino acid substitution per site. mou, Mouse; lem, Lemur; gib, Gibbon; ora, Orangutan; gor, Gorilla; chi, Chimpanzee; nea, Neadertal; den, Denisova; sap, Sapiens. However, DNA sequence similarities confirmed these results, showing a high percentage of TAS2R6P identity between Hominidae and Hylobatidae (>95%) and Prosimians, Hominidae and Hylobatidae (>75%). TAS2R18P sequences showed a lower degree of similarities (<70%) between primates and Prosimians (Additional file 6: Table S3 A-B). In addition, multi-alignments of TAS2R6P and TAS2R18P produced results in agreement with the findings described above. As shown in Figure 3A, TAS2R6P shows a high degree of conservation among all the species examined. Some of its stop codons, such as those at positions 7:141487959 and 7:141488049, are shared with the earlier representatives of this lineage. 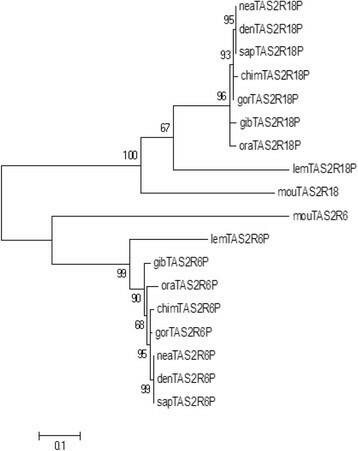 Besides species-specific changes found in lemur, and in agreement with the ancient time of the Strepsirrhini-Haplorrhini divergence (64 Mya), only one unique stop-loss mutation (TAG > CAG) was found in the chimpanzee TAS2R6P. All the human species (i.e. H. sapiens, Neandertal and Denisova) shared a fixed stop-gain mutation (TGG > TAG) on TAS2R18P (Figure 3b), which was not present in other primates that carry other stop-codon mutations at this locus and show a high degree of conservation between Hominidae and Hylobatidae. The reduced conservation between Prosimians and other primates is consistent with the view that the two pseudogenization events appeared at different times during their evolutionary histories. Multi-alignment of TAS2R6P (A) and TAS2R18P (B) stop-codon sequences. Conserved sequences are indicated in grey. Changes between humans and other primates are denoted in red, changes between Prosimians and primates are noted in blue, and the change between Chimp and other primates is noted in green. To better understand the species-specific changes that occurred in the TAS2R18P locus, the human exonic region of this gene was investigated (Figure 4). Four polymorphic insertions (rs10619393, rs373807934, rs66547287 and rs113657094) were identified in the reading frame, upstream of the seven stop-codons shared across species and downstream of the human-specific stop codon. One of them (rs113657094) showed clear differential distribution among continental clusters of populations, with Africans displaying a significantly lower frequency of the A insertion (42%) compared to other ethnic groups (86% in Latin Americans, 88% in Europeans and 97% in Asians) (Fisher’s exact test, adjusted p < 0.01). For comparison, the TAS2R6P sequence was also examined and neither insertions nor other structural variants were found. Human TAS2R18P sequence. Insertions are in bold, polymorphic SNPs in red and stop-codons in blue. Human-specific stop-codon is circled. A 200 kb (100 kb in both 5’ and 3’ directions) region surrounding both TAS2R6P and TAS2R18P was explored for linkage disequilibrium patterns. The TAS2R6P rs11761380 and rs1859645 polymorphisms were found to be in strong LD (r2 > 0.9) with SNPs rs62477710, rs10952507 and rs6962558 that reside in the functional TAS2R5 gene (Additional file 7: Table S4). In contrast, TAS2R18P showed no r2 values above 0.3 between variants. In addition, we analyzed the sequences of all the genes found in this enlarged genomic interval and compared them to the pseudogene sequences, in order to document the sequence similarities between pseudogenes and functional genes. TAS2R6P shares a common ancestor with the functional TAS2R5 gene (62.59% identity), while TAS2R18P has a high level of identity with the functional TAS2R42 gene and with the TAS2R67P pseudogene (66.59 and 67.02%, respectively) (Additional file 8: Figure S4). Pseudogenes derived from a very recent pseudogenization event (i.e. TAS2R64P) showed a much higher sequence similarity (91.32%) with their functional forms (i.e. TAS2R48), indicating ancient pseudogenization events at the TAS2R6P and TAS2R18P loci. Neutrality tests based on the analysis of frequency spectrum of variants were performed for each population. European and Latin American groups showed significantly positive values for both TAS2R18P Tajima’s D and Fu’s FS. Africans and Asians also showed positive values (1.04, 2.4 and 1.5, 2.8 respectively) for these statistics, although these did not reach significance (Figure 5). In contrast, TAS2R6P did not show evidence of deviation from neutral expectations in all the examined populations (p > 0.05). However, rs62477710, rs10952507 and rs6962558 polymorphisms in the adjacent TAS2R5 gene showed significantly positive values of Tajima’s D and Fu’s FS (Additional file 9: Figure S5). The maximum frequency of derived mutations (MFDM) test, which uses tree topology to infer selection, showed similar results. In fact, both TAS2R18P and TAS2R5 showed significant p-values (p = 9.16E-4 and p = 0.025, respectively), indicating that recent selection has acted on these loci. However, the p-values for this test were not significant for TAS2R6P (p > 0.05). Tajima’s D and Fu’s FS statistics for TAS2R18P in African, Asian, European and Latin American populations. Finally, the ages of these variants were estimated using a coalescent-based method implemented in the GENETREE package. Estimated ages turned out to be considerably ancient. For SNPs in TAS2R18P, rs2290318 was estimated to be 1,553,750 +/− 632,500 years old, while rs2290319 was estimated to be 1,113,750 +/− 495,000 years old, with a TMRCA of 3,520,000 +/−1,198,750 years. Similar values were also obtained for the TAS2R6P SNPs rs11761380 and rs1859645, with age estimates of 1,382,462 +/− 326,856 and 1,600,637 +/− 421,558 years, and a TMRCA of 3,457,712 +/− 1,326,856 years. A small number of studies have examined genes encoding functional bitter taste receptors and their corresponding pseudogenes from an evolutionary perspective ,,,,. In the present study, we focused on the recent evolutionary history of bitter taste receptor pseudogenes in modern humans. We found a modest level of variation and few haplotype blocks, as expected for pseudogenes in general. However, African populations showed a significantly reduced frequency of derived forms at TAS2R6P and TAS2R18P polymorphisms, at both the allelic and haplotypic level. Genomes of the archaic Neandertal and Denisova species also differed in the distribution of these derived alleles compared to modern human populations. In contrast to the usual pattern of human variation, the highest genetic diversity was found in non-African populations. Similarly, heterozygosity was higher in non-African populations. In addition, results from both population structure analyses and AMOVA demonstrated that most of variation was due to differences within populations. In fact, Europeans and Latin Americans fell into the same cluster and did not differ in allelic distribution, suggesting a similar pattern of SNP distribution in these two populations and highlighting the admixed nature of the 1000 Genomes American populations. Previous work ,, indicated that the pseudogenization event of TAS2R6P is very old, predating the divergence of Antrhopoidea from Prosimians. The TAS2R18P pseudogenization event occurred later in the primate genealogy, but still prior to the appearance of the Hominidae family. Our results were consistent with these findings: TAS2R6P variation patterns enabled the identification of a unique cluster grouping Prosimians, Hylobatidae and Hominidae families and high level of sequence similarity among primates (>95%), as well as between primates and Prosimians (>75%). TAS2R18P sequence similarity was lower between the mouse lemur and other primates (<70%) and the reconstructed phylogenetic trees showed longer branch lengths after the divergence of the two lineages. In addition, sequence similarity confirmed this view, showing a lower percentage (<70%) of identity between these two pseudogenes and their functional forms, when compared to the similarities between very recent pseudogenes and their functional forms (>90%). The analysis of the genomic regions surrounding these pseudogenes showed that TAS2R6P polymorphisms rs11761380 and rs1859645 were in strong linkage disequilibrium (r2 > 0.9) with rs62477710, rs6962558 and rs6962558 SNPs of the functional TAS2R5 gene, suggesting that evolutionary forces acting on this gene could have driven the allele differentiation at the TAS2R6P locus. To test this assumption, Tajima’s D and Fu’s FS tests were performed: these analyses showed that TAS2R6P did not show evidence of departure from neutral expectations while the neighboring TAS2R5 gene, which shared more than 60% sequence similarity with TAS2R6P, showed significant positive values for both these statistics. Since positive values of these tests may indicate balancing selection or may be the result of the confounding effect due to demographic history ,, the maximum frequency of derived mutations (MFDM) test was applied to further investigate the evolutionary history of these regions. The results of this test indicate that TAS2R6P has not undergone recent selective pressures, whereas TAS2R5 showed significant signatures of selection. This is consistent with balancing selection maintaining multiple alleles for long evolutionary times, and extending to maintain allele frequencies at closely linked neutral sites ,. The application of this test to TAS2R18 also showed significant signatures of selection and both Tajima’s D and Fu’s FS values were significantly positive at this locus in European and Latin American populations. This suggests that balancing selection potentially acted on the genes in these groups. In addition, these populations showed increased values of nucleotide diversity and heterozygosity in the TAS2R18P pseudogene compared to neighboring loci. Moreover, global FST values were unusually high compared to the typical range of 0.10 to 0.16 for estimated FST values in global populations ,, suggesting a high level of genetic differentiation among worldwide populations. These data are consistent with a scenario of balancing selection maintaining TAS2R18P alleles and enhancing genetic diversity at this locus in European and Latin American populations. Variants at TAS2R18P showed no evidence of association with adjacent functional genes. This pseudogene carries a human-specific stop-codon that is shared among H. sapiens Neandertal and Denisova. In addition, the exonic region of this pseudogene carried four polymorphic insertions in the reading frame, upstream of the shared stop-codons and downstream of the human-specific one. These data suggest that these insertions may have shifted the human TAS2R18P reading frame, with a consequent acquired function of this gene, shortly after the homo-chimp divergence. Such an event, followed by balancing selection operating outside Africa, would produce the observed TAS2R18P rs2290318 and rs2290318 different allele distributions in human populations. The estimated ages of these mutations indicate that they arose after the divergence of humans from chimpanzee that occurred 7–8 million years ago . We hypothesize that the human-specific stop codon located upstream of all these insertions represents a second inactivation, which happened before the split between H. sapiens, Neandertal and Denisova (from 400,000 to 800,000 years ago). Our results provide evidence for a dynamic role for TAS2R18P in primate evolution, suggesting that this locus may have acquired its function during the evolution of the human lineage, shortly after the homo-chimp divergence. This was followed by a much more recent deactivation due to the stop-gain mutation which was shared among modern humans, Neandertals and Denisovans. We speculate that this event may have been due to the disappearance of some bitter compound only found in Africa, which was specifically recognized by the product of this pseudogene, and that therefore the functionality of TAS2R18P was useful only in a given stage of human evolution. The article does not report new empirical data since the analyzed sequences were already deposited at public databases, including the 1000 Genomes Project, the UCSC Genome Browser and the Ensemble Genome Browser (see the Methods section for further details). This research was supported by the National Institute on Deafness and Other Communication Disorders Intramural grant number Z1A-000046-14. We would like to thank Dr. Marco Sazzini for help in preparing the manuscript and Drs. Igor Rogozin and Rob Morell for their helpful suggestions. DR and DD designed the study, performed the initial analyses, constructed the figures and tables, and wrote the first draft of the manuscript. DL and GM drafted the manuscript and guided all aspects of the study. ST contributed to design and implementation of statistical tests. All authors read and approved the final manuscript.